Oiless Tomato Stew is for you if you are looking to drastically cut down the quantity of oil in your meals. This stew contains all the goodness of the classic Nigerian Beef and Chicken Stew but without any frying or added oil. 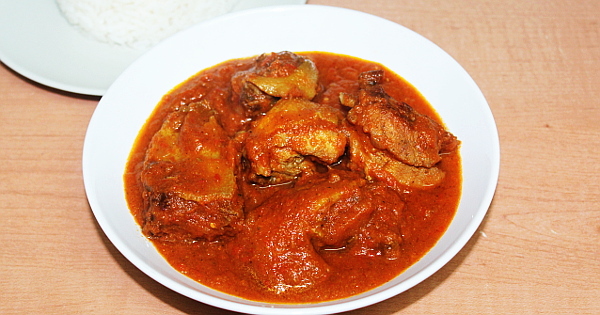 Chicken: Hen (female chicken) is tastier than the cockerel or rooster so it is my preferred chicken when cooking all my Nigerian recipes especially this Oiless Tomato Stew. With no frying the stew is quite bland so you need to use the tastiest ingredients when preparing this Oiless Tomato Stew. It is important to use all the above seasonings because they will help this stew taste great. The baking soda removes the tangy taste of tomatoes. Frying is what removes the tangy taste in the classic tomato stew but since there's no frying involved in this stew, we need the baking soda or any other ingredient that can remove the tangy taste of tomatoes. Serve with White Rice, Fried Plantain, Boiled Plantain, Fried Yam, Boiled yam and Agidi. Some people even add it to their Egusi Soup!